to get the picture just right. gotta love the freedom to embarass your children! this little beauty is for a….Meat Market! >Too funny!! Is that a chain around the cow’s neck?? You’re right. Some PETA group somewhere would have a fit if they saw it. LOL! Strange what we get used to and hardly notice… My kids think I’ve lost my mind sometimes. Good to know I’m not alone!About the bball pics==too bad you didn’t get dd’s boyfriend, but I bet the boys in the pic would pay money for that shot! It’s really awesome! >Neat sign. I just love things like this. Just so Americana-ish. Great colors. >funny picture and hilarious story. My dd is used to me just stopping the car anywhere and whipping out my camera. I do it almost every day at least once!!!!! >This sign brings back memories. 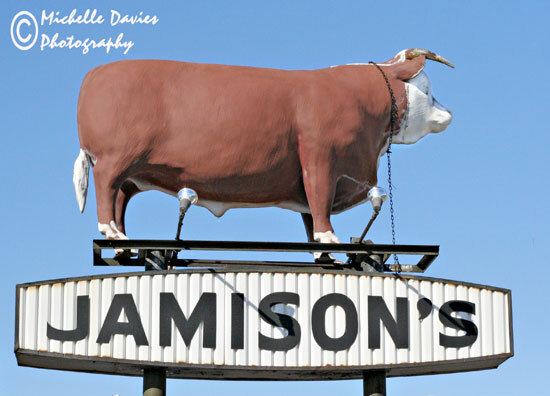 There used to be a dairy market in San Bernardino and ontop of the sign was a large dairy cow (b&w). And a meat market not too far away with a cow ontop of the building. TFS!